In December 1987 two deep manned submersibles MIR-l and MIR-2 were completed and tested in open ocean. In February 1988 the first scientific expedition with new vehicles, which were installed on board of the r/v Akademik Mstislav Keldysh, was conducted to hydrothermal TAG Site in the Atlantic. During ten years twenty two scientific and technical cruises with the MIR submersibles were done to different areas of the Pacific, Indian, Atlantic and Polar oceans. In present paper brief review of the expeditions with scientific purposes, as well as short introduction of the cruises on RMS Titanic and nuclear submarine wreck Komsomolets are provided. 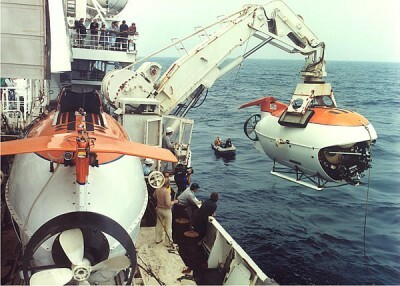 The operations with the MIR submersibles were quite noticeable for international cooperation in the field of oceanographic research of World Ocean. A brief enumeration of principal advantages of the submersibles MIR should commence with a note regarding their energy source. Total power capacity of the iron-nickel batteries is 100 kWh for each vehicle twice as much as is available in other submersibles with a dive capability of 6000 meters in depth. This high power capacity provides the ability to undertake long underwater work schedules (up to 17 to 20 hours total) and makes the most of installed equipment, which includes up to seven or eight pieces of 1200 W halogen- mercury-iodine (HMI) lights on each vehicle. These lights are advantageous for filming in the deep ocean. An underwater speed of up to 5 knots at a depth can be very important under conditions of high speed of underwater currents. The ballast system is another important feature of the MIR submersibles. Sea water is utilized as a variable ballast and provides a sufficient number of cycles during the dive by pumping water in and out by ballast pumps at any depth up to 6000 meters. Such a system gives almost unlimited possibilities for vertical maneuvering and provides a wide range of vertical speed from the first few centimeters up to 35-40 meters per minute. Trimming of the submersibles (standard bow angle range: 0-25dg) is provided by pumping seawater from forward to aft ballast spheres and back. The use of seawater for the ballasting and trimming, which requires only one common system with common ballast tanks for both purposes, has definite advantages compared to the use of mercury, which would require a separate system for the trimming as well as separate tanks. The use of mercury also requires a high degree of caution for safety. Undersea viewing possibilities is another important feature. Three view ports a central port with an internal diameter of 200 millimeters and two side ports of 120 millimeters each - give a wide viewing angle for two pilots and the observer/scientist. The MIR submersibles are equipped by modem navigation and scientific instruments, photo and video systems, manipulators etc. In different expeditions on the vehicles were installed additional equipment such as 3-d video system (National Geographic magazine), MAX movie-camera, external movie-camera (Lightstorm entertainment Inc.), HMI lights (up to seven pieces per vehicle), small ROV (Western space and Marine Inc.) etc. In period 1987-1996 twenty two expeditions with the MIR submersibles were conducted. Three general directions In underwater operations can be noticed: scientific research of hydrothermal fields on ocean bed (7 expeditions), the filming of RMS Titanic (2 expeditions) and research and special technical operations on nuclear submarine wreck Komsomolets (6 expeditions). See also: Photo gallery "Submarine vehicles MIR"
More in this category: « R/V "Professor Shtockman"